The subject of ‘Maternity And Childhood’s Hospital in Mukalla is a general problem for the fact that community in Mukalla and its suburbs desperately need such hospital; under forgetting that committed by the local authority for this hospital. We sincerely inform you that the hospital has a large and very important place in the hearts of people of the province in general. It is obvious to everyone that the reason for delaying opening the ‘Maternity And Childhood’s Hospital in 40 Apartments district is the disappearance of the electric generator and the oxygen station ?? Why this neglect of the hospital!! Where is the governor of the province? 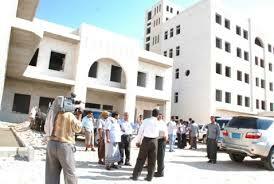 Where is the Director of Health Office in Hadhramout? Who is the main culprit in delaying the rehabilitation of this hospital? Who is the responsible for the disappearance of the medical equipment and supplies? Thereafter the local authority represented in the Governor of the province, General Major/ Ahmed Saeed Bin Break must search for the causes of the disappearance of these precious organs of medical equipment, oxygen station and electric generators which worth more than YR billion?? Where have they gone? Facts to be revealed of this to Hadrami people who are helpless and exploited. There must be specify of time limit under the supervision of a admitted and fair committee to complete the rest of the hospital equipment and detect the devices and equipment that have disappeared and begin to work hard to open the hospital as soon as possible.